Vacation Bible School (VBS) is our annual free summer Bible program for children age 4 through those entering 6th grade. VBS runs Sunday through Wednesday from 6:30 to 8:00 p.m. Children are divided into groups by age and after songs and a skit in the auditorium, each group rotates between four interactive stations: Drama, where teens act out the night's Bible story for the children; Quiz Game, where children are quizzed on what they learned in a fun and competitive way; Crafts, where children make something to take home each night that reminds them of the Bible lesson; and Application, where children play organized games designed to apply the lessons learned in a memorable and tactile way. At the end of the evening, children are dismissed to the Family Center for refreshments where parents can visit, grab a cookie, and sign them out. Adults are invited to remain in the auditorium during rotations for a Bible study led by different men in our congregation each evening, after which they join their children for refreshments. This year's Vacation Bible School is July 8-11, 2018. 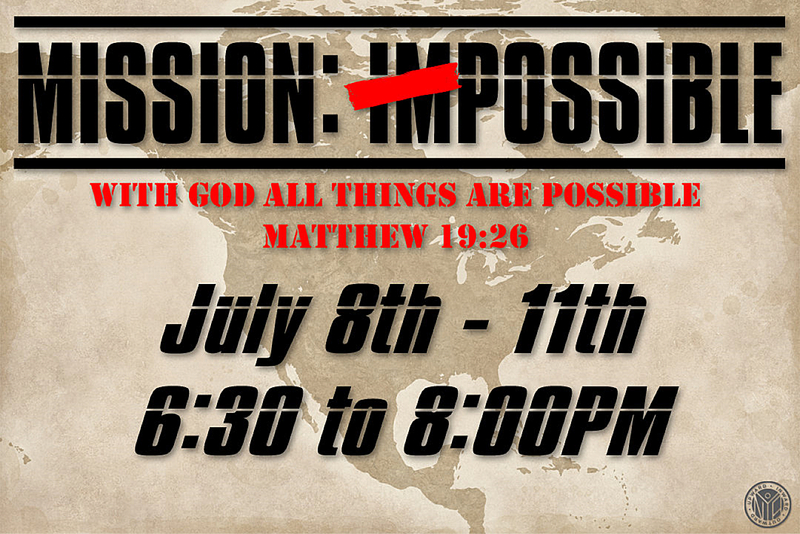 Our theme of "Mission: Possible" reflects that with God, all things are possible, a lesson Moses and the Israelites learned during the events we read in Exodus. Children will learn about having a plan of operation like God had for Moses; identifying valuable resources, such as Moses’ brother Aaron; infiltrating the enemy; and extraction and mission: accomplished, when God delivered Moses and the Israelites from Pharaoh and his army. Register online or in the lobby and mark your calendar for an enriching and memorable VBS 2018!